When families separate, children's sense of belonging can become fractured. All of the positive things that the family structure offered them can be lost and parents can become so consumed by what's happening to them that they forget about their children's needs. It's vital, therefore, that adults who separate work as hard as they possibly can to deliver the kind of consistent, safe and nourishing parenting that their children will need in order for them to grow up feeling happy and secure. 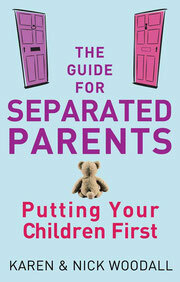 Children of separated families often talk about feeling split in two because their parents have been unable to build the kind of cooperative, flexible and respectful parenting relationship that would allow them to concentrate on learning and growing rather than protecting themselves from the fallout of the separation. Your children don't have to grow up feeling split in two. You can provide the kind of parenting that will allow them to reach their full potential and become happy successful adults. It won't necessarily be easy, but it will be worth it.